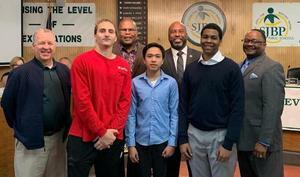 St. John STEM Magnet Program Principal Dr. Glenn Chenier, front row from left, recognized students Matthew Billings, Cyrel Rodigazo and Avery Williams along with St. John the Baptist Parish School Board President Patrick Sanders and, back row from left, St. John STEM Magnet Program teacher and chess coach Rene Phillips and Superintendent Kevin George. Students from the St. John the Baptist Parish Public School District dominated their field in their first trip to the Louisiana State High School Chess Competition. Students Matthew Billings of East St. John High School, George Smith of the St. John STEM Magnet Program (ESJH), Avery Paul of the St. John STEM Magnet Program (ESJH) and Cyrel Rodigazo of East St. John Preparatory Academy competed March 30. The students outperformed their field against many veteran chess programs competing in the casual player division, with Billings taking first place with a perfect 4 wins and 0 losses. Smith tied for second with 3 wins and 1 loss. Their performances and a win by Paul secured the students the first place team trophy. Based on their performance, Billings and Smith also earned the chance to compete again in New Orleans for the chance to represent Louisiana in the National High School Chess Championship in Florida later this year.